Regatta continues to raise money and awareness for women’s sailing. LONG BEACH — The 27th annual Linda Elias Memorial Women’s One-Design Challenge, or LEMWOD, will be held in Long Beach on Oct. 13 and 14, with Long Beach Yacht Club serving as host. Teams from the Channel Islands, Long Beach, Newport Beach, San Diego, Santa Monica, Washington and even Mexico compete in LEMWOD, considered one of best women’s yacht races on the West Coast. All teams compete against each other aboard Catalina 37 boats. A dock party and optional team practices are scheduled for Oct. 13. Formal racing begins at 11:55 a.m. on Oct. 14; team check-in (with skipper present) starts at 8:30 a.m. The first day of racing concludes with a poolside party ($25 fee); the party includes a no-host bar, DJ and silent auction fundraiser. Day two of racing (Oct. 15) also starts at 11:55 a.m., with a trophy presentation at Long Beach YC’s pool patio immediately after the last boat comes in; a reception with no-host bar and appetizers will be held at 4 p.m.
Last year’s LEMWOD took place inside the Long Beach Breakwater and near Belmont Pier. Long Beach YC’s Women’s Sailing Team (skippered by Wendy Corzine and Lisa Meier) won the 2017 LEMWOD, which featured a field of 11 competitors. LEMWOD debuted in 1991 as a two-day competitive racing event for women. 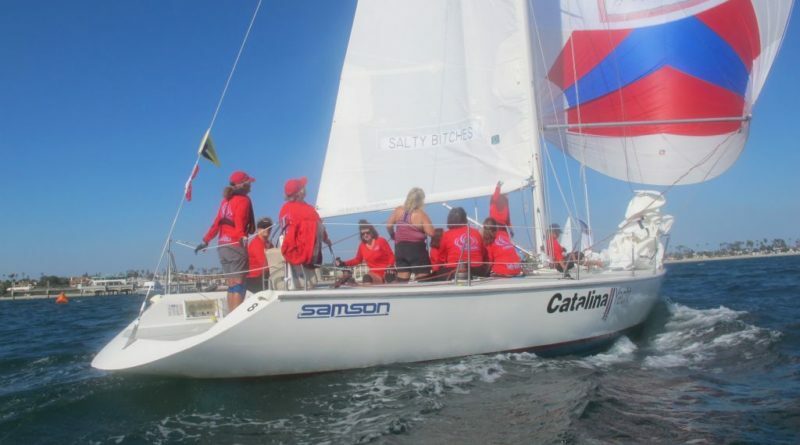 Long Beach Women’s Sailing Association created and organized the regatta to raise money for and awareness of women’s achievements on the water. The regatta is named after Linda Elias, who won three of the first five events and, in 2002, succumbed to ovarian cancer at the age of 52. The Long Beach Sailing Foundation established the Linda Elias Sailing Scholarship Fund shortly after Elias’ death. Long Beach Yacht Club is at 6201 East Appian Way in Long Beach. More information about the Long Beach Women’s Sailing Association can be found online at lbwsa.org. There is a practice day on 10/12. Regatta dates are scheduled 10/13-14. Silent auction/ pool party is held 10/13.